In Thomas Morley's First Book of Consort Lessons, there is a very fine consort arrangement of John Dowland's 'Lachrimae Pavane' and, as a tribute, we have taken Lachrimae as the name of our consort. 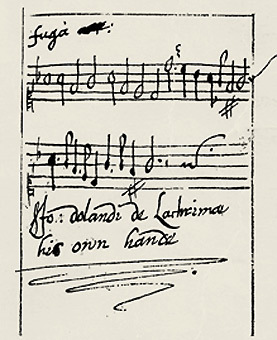 This composition, originally for lute solo, was so famous throughout Europe during Dowland's lifetime (1563-1626) that he even signed himself, in a latinised form, as 'Jo: Dolandi de Lachrimae' in the manuscript shown above. We have used his own handwritten version of Lachrimae to create our logo on this website. Dowland also used his Lachrimae composition to create a beautiful and equally famous song, Flow my tears. At the height of his fame, in 1604, he also produced a book of consort music called 'Lachrimae', which he subtitled 'or seaven teares figured in seaven passionate pavans, with divers other pavans, galiards, and almands, set forth for the lute, viols, or violins, in five parts'. The wonderful seven pavanes, which begin his Lachrimae book, are all based on his original Lachrimae theme, and are unique in the length and intensity of creativity in purely instrumental music of that time. The consort required is different from the 'consort of six', requiring five viols (or violins) with a single lute. The print on the left side of this page is the only known possible picture of Dowland (with the lute in the centre of the picture), playing in a consort whilst in the employment of King Christian IV of Denmark. It is taken from the frontispiece of a book of madrigals.